A map series is a collection of map pages (also known as map sheets) built from a single layout that represents a geographic area. The most common type is a spatial map series where each map page displays a portion of the larger geographic area based on a feature's geometry. For example, a spatial map series might contain an individual map for each county in a state, each country in a continent, or each parcel in a new subdivision. Each page, or sheet, in a map series also typically contains map elements—such as the map title—that change to reflect the name of the area shown in the particular map sheet. A map series allows you to generate a set of output pages using a layout and iterating over a set of map extents. The extents are defined by the features in a layer and are sometimes called tiles, sections, or areas of interest (AOI). The layer that defines the extents is referred to as an index layer. 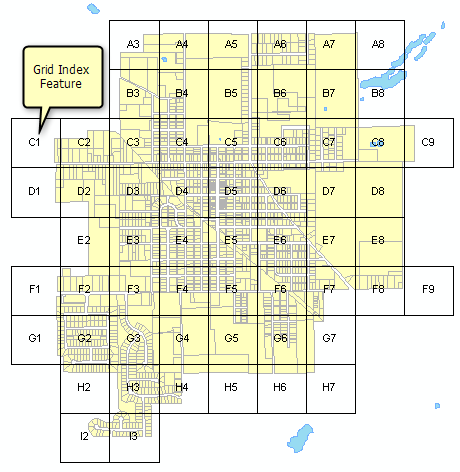 Any feature layer in a 2D map can serve as the index layer. Map series are not supported for 3D scenes. For ArcMap users who are new to ArcGIS Pro, a map series will be familiar. Data Driven Pages are the equivalent in ArcMap. A single layout defines the map composition for each map series page. Only dynamic parts of the layout change with each page; static elements stay the same. Any changes made to static elements of the layout are reflected on each page of the map series. The features in the index layer can be noncontiguous, overlapping, and represent various shapes and extents. The features can be points, lines, or polygons. The extents for line and polygon features are based on the feature's spatial envelope. For example, a polygon layer representing political boundaries can be used to drive the extents for each map sheet. Points can also define an extent when a scale is provided. Nonfeature layers, such as raster layers, cannot be used for the index layer.